You’ve likely heard some buzz about Stitch Fix on Facebook or through one of your (other) favorite blogs. My first box from this super-genius online styling service came last week and I could hardly stand how excited I was to see what they picked for me. 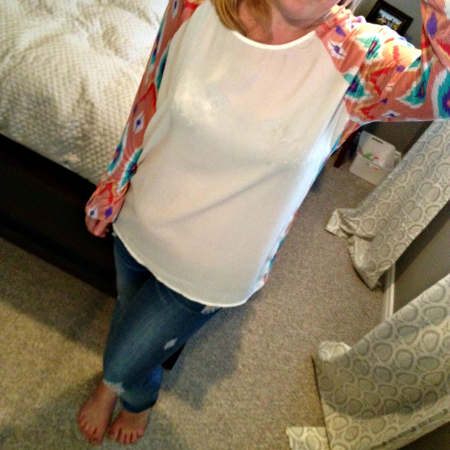 Stitch Fix is like having a personal shopper, but much better. You start by filling out a very detailed (but fun!) online style survey where they ask you all sorts of questions about what clothes, accessories, fit and styles you prefer — you can even tell them specifically what you don’t like or want, which is helpful. You pay a $20 styling fee (which is automatically applied to anything you buy from your box) and then pick a date for delivery. I had actually ordered my first box a couple of months ago, but they are in such high-demand right now that it just arrived. Once your box arrives, you have three business days to pick what you want to keep. They send you five items in a box, all hand-picked by your own personal stylist, who stays with you during your entire Stitch Fix relationship (I love that!). As you can see from the little note that my stylist, Maria, sent me, they even check your Pinterest account to see what current fashions you’re inspired by. Hello, that’s so brilliant! 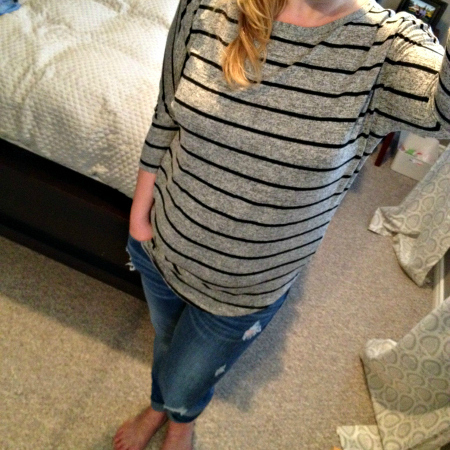 I loved this super-soft dolmen-sleeve tee, but it seemed to collect my muffin top in just the wrong place. I really loved this top, even though it was something I would have never picked off of the rack. But, the fit under the arms was just too big. This jacket just wasn’t my cup of tea. The color was cute, but the fit was all wrong. I might take outerwear off of my list of what I’d like them to include in my box. 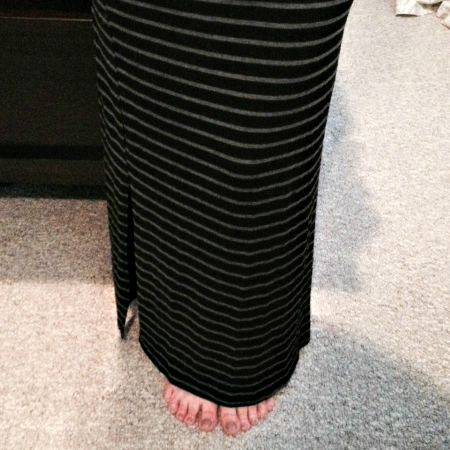 I considered keeping this skirt, but it was a hint too small and I wasn’t sure I’d wear it much. This lightweight sweater was so soft and fit great. I knew that I’d wear it often over the spring and summer and that I could easily dress it up or down. Smitten, for sure! The sweater I kept was $48 and I had already paid the $20 styling fee when my box shipped, so I owed Stitch Fix another $28. If I would have kept all of the clothes they sent me, I would receive a 25 percent discount, making this box less than $200 for all five pieces. Not bad, especially for the quality and selection they sent. These are pieces that you will have for years, not cheapies that you’ll burn through in one season. Once I made my selection, I packed the others in the pre-paid envelope and popped them in the mail, back to Stitch Fix. Then, I hopped online to tell them what I was keeping, to pay my tab for the sweater and to give them feedback about the pieces I had returned. And, of course, to schedule my next fix, which will arrive in early July! Have you tried Stitch Fix yet? You can use the bellingFAM referral link to get your first fix, but if you’re interested, book it now, as they are already scheduling into July! Goes to show how popular it is, right? // This giveaway is closed. Please click the link below to see the winner. This giveaway was provided by bellingFAM. 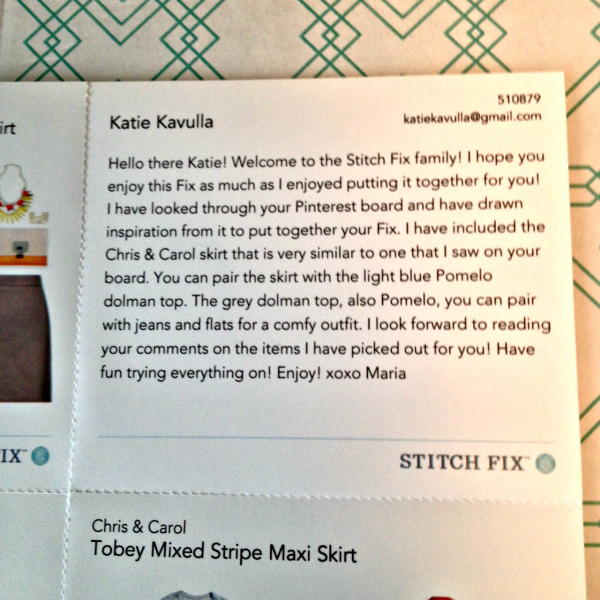 Please note that links to Stitch Fix in this post are referral links, as referenced. 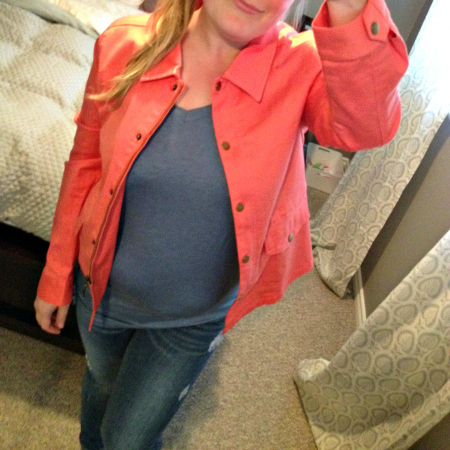 This entry was posted in Fashion & Style, Mom Style and tagged 2014, Mom Style, Stitch Fix on May 6, 2014 by Katie Kavulla. I was thinking about you and wondering if you’d tried it yet! Excited to see what they sent! xoxo.